Fashion design students in the School of Art, Architecture + Design work on outfits made with an $8 budget. The students will display their new spirit wear designs and repurposed clothing Feb. 11-15 for IU's bicentennial celebration. 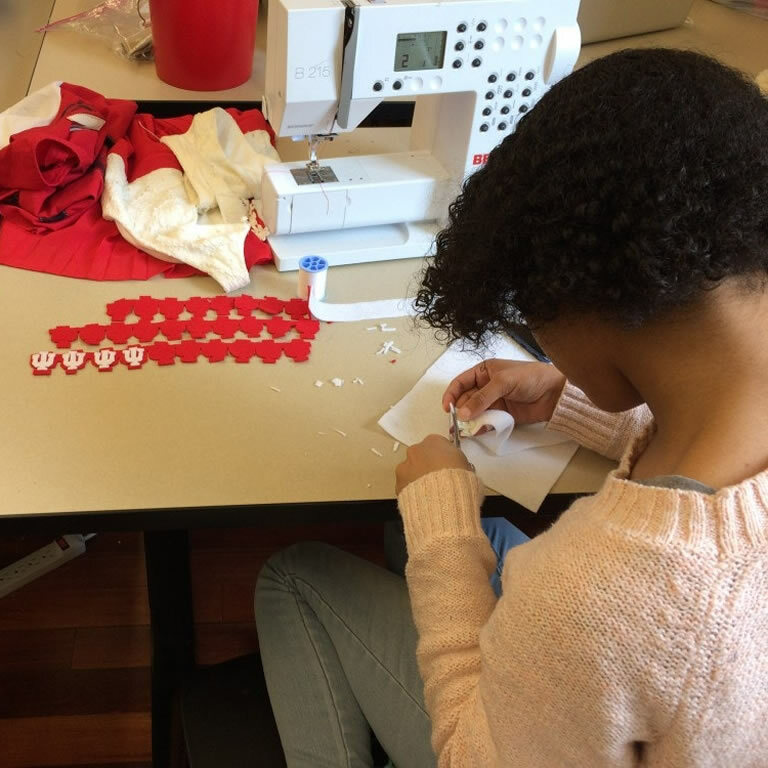 Designing IU spirit wear provides the students an opportunity to discover the traditions of Hoosier pride from the perspective of material culture, fashion design professor Lori Frye said. The students have been tasked by the university to create cream and crimson spirit wear that not only encompasses how the university's past influences its future, but also how existing garments may be re-fashioned into new designs. The fashion industry is dominated by fast production and extensive textile waste. Fashion design professors Bo Choi and Frye said they believe it is essential for students to learn about the global impact the industry has on the environment. For this exhibition, the students were given an $8 budget to purchase materials from the local Goodwill that they needed to create their recycled spirit wear. "We want the students to learn Indiana University’s history, and then visually represent IU’s 200 years through a fashion lens," Frye said. Having students deconstruct pre-existing garments to then reconstruct them into something entirely different teaches them the manufacturing and production aspects of fashion, not just design. The fashion design program also wanted to give students the opportunity to showcase or debut their work, Frye said. "We teach our students to be makers that construct the actual garments," Frye said. "We give our students free reign to design whatever speaks to them, and with this comes problem solving of design and construction, as well as self-reflection." Above all, Frye and Choi said the exhibition aims to celebrate the university's bicentennial year while providing new and collaborative opportunities for fashion design students. Although this project is still in the works, it will be widely publicized throughout campus in the near future, Frye said. The exhibition will be on display in Kirkwood Hall Room 112.